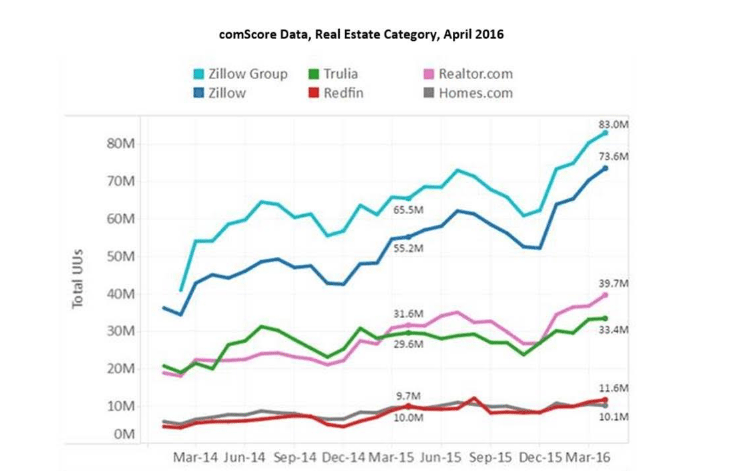 ComScore's latest website traffic data shows that the Zillow Group network dominated with 83 million users total in April and now accounts for 64 percent of the online real estate market share. The second most popular site, News Corp.'s Realtor.com, is also claiming more of the internet traffic pie with 40 million unique users in April, a 25 percent spike year-over-year. Traffic drops off after Realtor.com for the fourth and fifth most popular real estate websites, Redfin and Homes.com. Zillow.com hit a new traffic record in April with 73.5 million unique users across desktop and mobile devices, a 33 percent year-over-year spike and net add of 18 million people, according to the latest rankings from comScore. 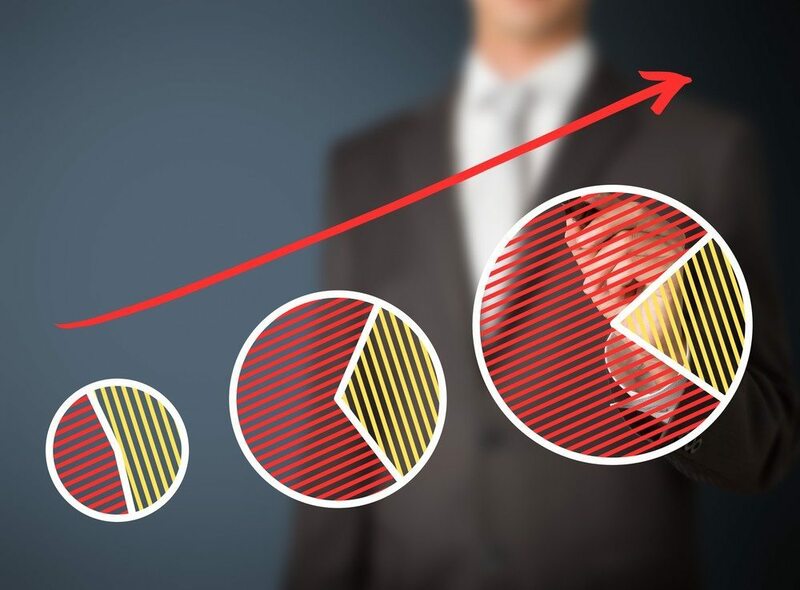 This growth boosts the individual portal’s online real estate traffic market share to 57 percent, up from 48.8 percent one year ago. The second most popular site behind Zillow.com, News Corp.’s realtor.com, is also claiming more of the internet traffic pie with 39.7 million users in April, a month-over-month increase of 8 percent — and, perhaps more significantly, a 25 percent jump year-over-year. Realtor.com is also claiming more of the internet traffic pie with 39.7 million unique users. Falling under the Zillow Group umbrella, Trulia attracted 33.4 million visitors — vying for that No. 2 spot against realtor.com — up 13 percent year-over-year and just 1-percent since March. With the combined data from Zillow.com and Trulia, the Zillow Group network dominated with 83 million users total in April, now accounting for 64 percent of all real estate web consumer traffic. During the company’s first-quarter earnings call, CEO Spencer Rascoff discussed growing Zillow Group’s audience size as one of the network’s four main target growth areas. More than 166 million unique users came to Zillow Group’s mobile apps and websites during the month of March, up 22 percent year-over-year, he said. “Every one of our consumer brands, including our largest brands, are at or near record traffic levels and growing quickly,” Rascoff added in the announcement. Traffic drops off for the fourth and fifth most popular real estate websites. Redfin captured 12 million users (up 5 percent from March and representing 16-percent growth since last year). Zillow Group dominated with 83 million users, 64 percent of all real estate traffic. While homes.com came in close behind with 10 million visitors in April, a yearly increase of 5 percent, its growth shows signs of stalling, with 3 percent fewer visitors month-over-month.